Disaster Aid Australia have been working with the Balay Mindanaw Foundation on the island of Mindanao for many years. 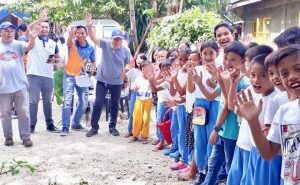 The initial contact was through the Rotary Club of West Cagayan de Oro who have continued to support Disaster Aid Australia’s project and Balay Mindanaw. Over 50 SkyHydrant installations have been completed. Balay Mindanaw Foundation Inc.(BMFI) is a Filipino Mindanao-based and focused non-profit organization. BMFI’s work and its people articulate a sense of fierce pride for Mindanao and a passion for transforming this poorest and most conflict-torn of the country’s region into a “balay”, a true home for its peoples – Christians, Muslims and Lumads, indigenous peoples of Mindanao. Helping Build Empowered Sustainable Communities. Helping Build Peace in Mindanaw as it pursues its vision of Kaangayan, Kalambuan, Kalinaw sa Mindanaw, sa Pilipinas, sa Kalibutan (Equality, Development, Peace for Mindanao, for the Philippines and for the World). Its peace-building and development work in the rural areas of Mindanao are pursued through principled partnerships with the people’s organizations, non-governmental organizations, local government units, government agencies and other sectors. They work towards the building of a Mindanao which is truly a home (“balay” and “banay”) for its tripeople – the Moros, the Lumads (Indigenous Peoples) and the settlers.